Any payments made by an individual, group, or entity to Shepherd Field Tours for a pilgrimage package by default constitutes unconditional agreement with the terms and conditions stated here. REGISTRATION: To reserve space on a pilgrimage, a deposit of $300 (payable by cash, check, or online payment) is required along with a completed, signed, and dated registration form. Registrations are processed in the order they are received by Shepherd Field Tours, and registration is completed only when both the deposit and the completed registration form are received. A registration form with incomplete information is not considered complete until all required information is submitted. PILGRIMAGE PREPARATION MATERIALS: No later than one month before departure, participants and groups will receive (via email) online preparation materials from Shepherd Field Tours. Within one week of return, individuals and groups will also receive (via email) follow-up materials to aid in unpacking the pilgrimage experience. Groups can also elect to receive materials for in-person discussion groups, to be led by a leader, chaplain, or volunteer of the group. PAYMENTS: A deposit of $300 (payable by cash, check, or online payment) is due at the time of registration. Payments made by credit card incur a 3% convenience fee. The $300 deposit is non-refundable. Shepherd Field Tours retains the right to cancel any reservations that are not paid in full 90 days prior to departure and to charge any applicable cancellation fees or penalties listed below. A non-refundable $50 fee will be charged on all checks returned by our bank. All cancellations must be received in written form (by letter or email). Cancellations are possible at any time but refunds will be subject to the cancellation fees at the rates listed on the invoice received by Pilgrims. If Shepherd Field Tours cancels the pilgrimage for any reason other than safety, security, natural disaster, acts of terrorism, acts of God, or any other circumstances beyond Shepherd Field Tours’ control, Shepherd Field Tours will refund the entire amount paid minus any non-refundable deposits paid to third-party vendors. Shepherd Field Tours bears no further responsibility beyond the refund. Please be advised that the U.S. Department of States warns U.S. citizens of the risks traveling to Israel, the West Bank, and Gaza due to the complex security environment there and the potential for violence and renewed hostilities. Shepherd Field Tours makes the safety and security of our pilgrims the highest priority, and we monitor the ongoing developments in the Holy Land very closely. Please be advised that traveling to any country includes inherent risks, and that Shepherd Field Tours cannot guarantee the complete safety and security of the group and of individuals at all times. We highly recommend the purchasing of travel insurance. Packages are available online or at our website: www.shepherdfieldtours.com , and we recommend that you review the terms and conditions carefully. Or we may offer a group insurance for you. All participants on a Shepherd Field Tours pilgrimage must have appropriate travel documents. On pilgrimages that leave the country, all participants are required to have a valid passport. Passports must be valid at least six months past the date of anticipated return. It is the individual’s responsibility to secure any necessary visas or other travel paperwork. Non-U.S. citizens should check with their appropriate governmental agencies to ensure their understanding of travel requirements. It is the responsibility of the individual to obtain all necessary travel documents (i.e. passports or visas) needed to participate. Every effort will be made to accommodate the health needs of each participant. Please be advised that most foreign countries do not conform to the same standards as found in the USA Disabilities Act. Shepherd Field Tours cannot provide individual assistance to pilgrims for walking, eating, or getting on and off modes of transportation. Participants who need this type of assistance are welcome to provide their own travel companion at their own expense. Or you can contact us for these arrangements if available. Please be advised that Shepherd Field Tours cannot guarantee access to all pilgrimage activities, tours, or sites, especially if a participant’s mobility is severely restricted. Shepherd Field Tours accepts no responsibility for a participant’s inability to fully participate in any or all portions of the neither pilgrimage, nor can Shepherd Field Tours provide any refund for non-participation in any part of the pilgrimage. All group airline tickets are round-trip, economy class tickets and are non-refundable from the time of ticketing. Participants on a group flight cannot use frequent file miles to purchase their tickets, although they can add their frequent flyer number to their paid ticket when they arrive at the airport. Any cancellations, alterations, or failure to use confirmed space will be subject to the penalties and fees given by the airline. Please note that airfares, airline carriers, and schedules are always subject to change without notice. While Shepherd Field Tours attempts at accurately anticipating required airline taxes, fees, and fuel surcharges, any excess fees levied by the airlines beyond the original total price at time of booking will be the responsibility of the individual participant. 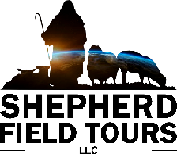 Shepherd Field Tours retains the right to pass these excess charges on to the individual even if the actual cost is higher than the expected cost advertised. Shepherd Field Tours is not responsible for any transportation expenses that are incurred due to an individual concern (missed flight, change of itinerary, illness, etc.). Deviations from the group flight are not possible, and seating preferences can be requested directly to the airlines upon check-in. Shepherd Field Tours cannot guarantee any seating arrangements or requests. International destinations typically are allowed one free piece of luggage, but please be advised to check the requirements of each unique airline. Shepherd Field Tours is not responsible for any luggage fees or any other expenses incurred by individuals traveling on a group flight. Participants are also required to porter their own luggage between all destinations. We strongly recommend that you pack only one piece of checked luggage and one carry-on. Shepherd Field Tours is not responsible for loss, theft, or damage of any bags or items at any time. Prices quoted include lodging in double-occupancy rooms with private bathroom facilities. A limited number of single-occupancy rooms are available at an increased fee. Lodging is provided at Deluxe Hotels or religious guesthouses or similar. Travel within the Holy Land will be on a private, chartered coach bus. Local guides will also be provided. Two meals per day are included while in the destination country. Personal meals are not covered during travel days (in the airports or on airplanes), and one meal per day is not included. Refunds for unused meals are not available. Special dietary needs can be requested, and every effort will be made to accommodate participants with special dietary concerns. However, Shepherd Field Tours cannot guarantee the availability of dietary accommodations at all meals and restaurants. The pilgrimage fee does not cover any fees or expenses incurred by individuals or groups for passports, visas, personal meals, extras beyond provided meals or beverages, travel incidentals, personal expenses, baggage, or any other items not explicitly stated as included. Please be advised that Shepherd Field Tours reserves the right to take photographs and video during any pilgrimage activities and to use captured media for promotional use. Any individual that prefers their image not be used for promotional purposes is kindly asked to notify us via letter or email before departure.